Aloo chokha is mashed potatoes with spices from the Bihari cuisine. Usually, aloo chokha is eaten as a side for Litti. You can eat it as a side for roti or dosas. Sometimes I eat as it is with a few salad veggies as a light meal. Potato is a versatile vegetable and often misunderstood. They are rich in vitamin C, B6, folate, iron, magnesium, and potassium. And they provide instant energy, often eaten as post workout meal. Potatoes taste yummy in all forms – baked, mashed, boiled, steamed, fried. Occasional frying is also good if we use cold pressed oils. Potato starch is used in baking as well for making gluten-free bread or biscuits. If you love potatoes, you might like this side dish, potatoes in mushroom sauce as well. Peel and cut potatoes into equal sized cubes. Take potato pieces into a cooking bowl and add water so that they just submerge. Alternatively, you can steam or pressure cook the potatoes. 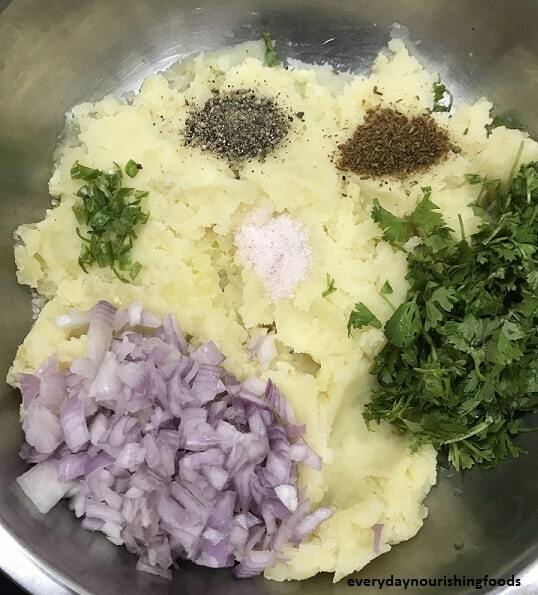 Once potatoes are cooked completely, mash them with potato masher or fork. Now add all ingredients (chopped onion, green chili, coriander leaves, black pepper powder, roasted cumin powder, salt, lemon juice, ghee) and mix everything well. Serve Aloo chokha hot or cold. Traditionally it is eaten with Litti. Adjust green chili, pepper powder, lime juice and salt according to your preference. 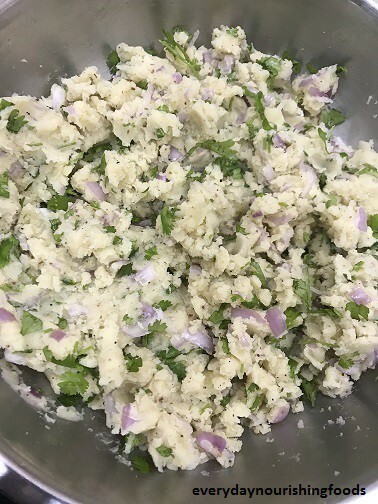 Finely chop onion, green chili, and coriander leaves.